Suba Galaxy Hotel Bombay, Hotel India. Limited Time Offer! Of a BudgetRead more category, the Suba Galaxy Hotel has all the comforts such as : Restaurant, Laundry, Television, AirCon.The hotel is located in the north-east section of Mumbai (Bombay), at , only 12 minutes by car from the city center.This hotel offers high speed internet.You can reach Chhatrapati Shivaji in 16 minutes by car (the airport is 5 miles from the hotel). 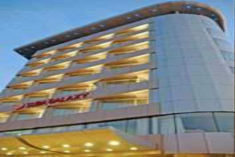 Hotel Arma Executive is conveniently located in the popular Andheri / International Airport area. Featuring a complete list of amenities, guests will find their stay at the property a comfortable one. Set in a prime location of Mumbai, Hotel Parklane puts everything the city has to offer just outside your doorstep. Both business travelers and tourists can enjoy the hotel's facilities and services. Set in a prime location of Mumbai, Hotel Tiptop puts everything the city has to offer just outside your doorstep. The hotel offers a wide range of amenities and perks to ensure you have a great time.